"We train to save lives and something like this today is difficult for us"
The search for the woman who was caught in a cliff slide at Fort Funston in San Francisco continued through most of Saturday but there are fears her body may have been taken out to sea during high tide. Sergio Quintana reports. 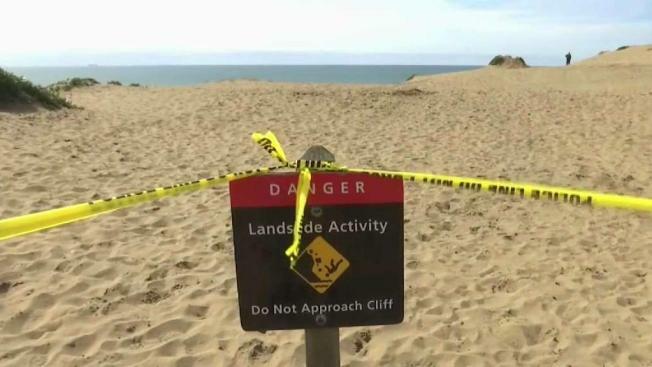 Recovery efforts for a woman believed to be trapped under a cliff collapse at San Francisco's Fort Funston beach continued Saturday, but officials from Golden Gate National Park Services said they are not sure whether the woman is still buried or washed out to sea. Rescue efforts for the woman, who was walking on the beach Friday afternoon with her friend and a dog, turned into a recovery effort later that day. National Park Services spokesperson Charlie Strickfaden said that the two women in their twenties were walking on the beach when a portion of the cliff gave way. The woman who survived was buried in the sand up to her shoulders and was rescued by bystanders. She was transported to the hospital with minor injuries. Strickfaden said investigators were able to talk to her but "she was in shock from what happened to her friend." The dog was also rescued and is doing fine, he said. The other woman was reported by witnesses to be buried under the collapse, prompting a search that lasted three hours before authorities turned the operation into a recovery effort. Strickfaden said a part of the slide was washed away to see after the tide came in around 2:30 p.m. on Friday. Crews will be out at the beach digging until dark, he said. "The Coast Guard has been advised about the possibility of the body being out in the sea,' he said. Crews will be checking the stability of the cliff, but the beach will not be closed, Strickfaden said. "Collapses like this are rare," he added. "Ocean waves come into the bluff and undermine it ... The base of the bluff is constantly evolving here," he said. "Unfortunately we consider this a tragic natural event." According to Strickfaden the high tide is preventing recovery efforts. "We'll see what we find after the water recedes," he said. The equipment used so far for the recovery effort include small tractors and canine units. Crews from the San Francisco Fire Department have been helping with the search and recovery efforts. "Crews made a very valiant attempt at saving this young woman's life. It hurts, it's tough," SFFD Chief Joanne Hayes-White said Friday. "We train to save lives and something like this today is difficult for us." A dog walker who was at the beach right before the slide says people were walking under the cliffs because the tide was high. "The waves were coming up so close you had to walk a little bit on the cliff at times," said Dana Allen from San Francisco.